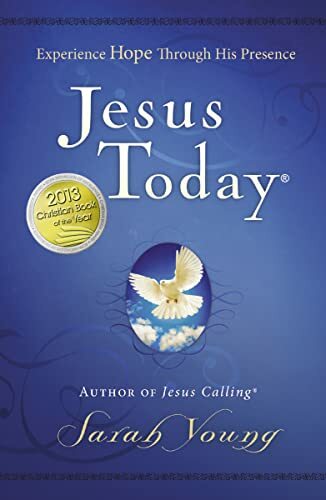 Experience Jesus TodayTM, recently named the ECPA 2013 Christian Book Of The Year!Jesus TodayTM was written during a very difficult time in Sarah Young's life. Yet the words of Scripture and Jesus' own Presence were ever near, bringing her hope and comfort for each new day. Whether you need a lifeline in your discouragement and hurts or are longing for a close intimate relationship with the Lord, you will delight in this new devotional book - a sequel to #1 bestselling Jesus Calling (R)., It is written as if Jesus Himself is assuring you that He is in control, that He is good, and that a glorious future awaits all who anchor their hope in Him. Reaching out with peace-filled reminders of Jesus' Presence from the Word of God, these devotions will intimately, quietly connect you with Jesus, the One who meets you right where you are. Sarah Young's devotional writings are personal reflections from her daily quiet time of Bible reading, praying, and writing in prayer journals. With sales of more than 16 million books worldwide, Jesus Calling(R) has appeared on all major bestseller lists. Sarah's writings include Jesus Calling(R), Jesus Always, Jesus Today(R), Jesus Lives(TM), Dear Jesus, Jesus Calling(R) for Little Ones, Jesus Calling(R) Bible Storybook, Jesus Calling(R): 365 Devotions for Kids, and Peace in His Presence-each encouraging readers in their journey toward intimacy with Christ. Sarah and her husband were missionaries in Japan and Australia for many years. They currently live in the United States.